Jase Hamilton attended San Diego State University and graduated with his Bachelors of Arts degree in Economics. Jase joined Cavignac & Associates in 2012 and currently holds the role of Account Executive in the surety department. Prior to joining Cavignac & Associates, Jase served as a surety underwriter for the Insurance Company of the West in San Diego. 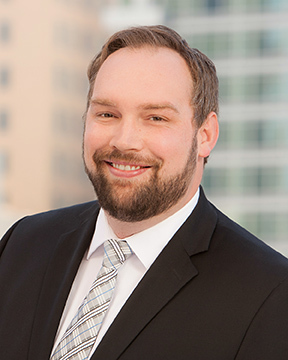 Jase earned his Associate in Fidelity and Surety Bonding (AFSB) in 2014 as well as his Chartered Property Casualty Underwriter (CPCU) in 2016. Jase focuses on both contract & commercial surety bonds including performance & payment (labor & material), license & permit, fidelity, court, miscellaneous and subdivision. Jase is an active member in multiple associations, including Surety Association of San Diego and Construction Financial Management Association of San Diego where he currently serves as Board member. Jase also remains active in various local & national trade associations including the National Association of Surety Bond Producers, the Association of General Contractors and Associated Builders and Contractors. He’s also is a proud member of the East County Posse. Jase reside in San Carlos with his wife and two daughters. In his free time, Jase plays in recreational softball leagues and enjoys playing Texas Hold’em, golfing, traveling and spending time with his family.